DSCN1334.JPG, a photo by kaihizzle on Flickr. Western psychologist, Ellen Langer (1975), claims that people gamble, even they know that on average the establishment wins, because they think that their choices are special, luckier, better than other peoples choices; gamblers suffer from an illusion of control. They think that they can effect the outcome of their bet by making the right decision. And for this reason, Western gambling usually includes an element of control (skill) and above all, lots of choices. The roulette wheel is typical in in that it provides the gambler with lots of ways to bet, to play a hunch, to beat the odds with a certain system. 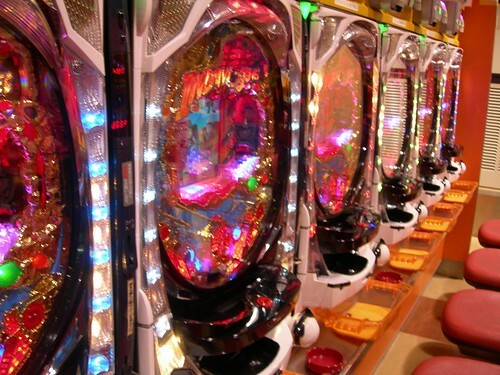 Pachinko however involves little in the way of choice and surprisingly little skill. The only important choice, as far as I am aware, is the decision on which machine (dai) to use. This is important because machines are, by law, meant to be set to have a certain odds of winning which remain constant during business hours and since it is important that some people win, parlours usually set up number of winning machines. About the only useful advice I have read on this is that since the owner wants as many people as possible to be near a winning machine, the winning machines are generally fairly evenly situated roughly in a zig zag. However, it has been my impression, and that of a frequent player, that some parlours illegally control the odds in real time setting machines to win especially when they see a new face. In other words there really may be beginners luck in some Pachinko palours because the non-beginners are more likely to play anyway and having beginners luck, as experienced by the lady in the article, helps to get people hooked. Secondly newly installed machines are sometimes more likely to be set to win to give customers the impression that rich parlours with a turn over of machines are places where they can win. While pachinko magazines may report various techniques, the only skill that many rank and file players seem be aware of is to direct the balls to the right place. Once this place has been found (and magazines claim to tell their readers where this is) punters will sometimes use a coin to keep the dial in the same position. There is some skill in getting the balls roughly in the centre,roughly on a sweet spot, but it makes surprisingly little difference where the balls hit. If skill were important the machines could be made more like video/computer games with moving targets but this is not the case. So if choice and skill are not all that important in Panchinko, why do Japanese people become addicted? They know that the parlours are making money and that on average the machines are set so that the players loose. How can they have an illusion of control, an illusion of uniquness that they will win whereas other players will not? My theory is, from talking to a few players, and from the way in which machines don't pay much then suddenly pay out big time ("reach" and then “win time”), is that players ave an illusion of having more gut, or mettle (根性/konjou) than other players. They think that they can keep their hand steady, and keep pumping the machine until it pays out when other players would have become lilly-livered and given up. This illusion of control is partially true, just as their is a partial truth to the effect of choices in Western gambling. Addicted players do play longer, and do thus stay on to "reach" the big payouts. The difference lies in what personal characteristics each culture emphasises. Westerners believe in the power of their free will, in their ability to make unique beneficial choices that others have missed. Japanese believe that they are able to persevere, suffer, grind on, fight, ganbaru longer than others, to the point of having an illusion of uniquness and an illusion of control. This illusion of uniqueness is furthermore not, I think, an enhancement of a particular characteristic so much as the belief in the players ability to have none, no characteristics, completely unswayed (even in spite of all the loud noises and flashing lights), to keep hitting that sweet spot, to be come like a rock, to become nothing. And thus pachinko resembles Buddhist meditation, and pachinko machines resemble mandelas, and one of their effects is to empty the mind of the player. This makes pachinko particularly attractive, and addictive, to those that have troubles enough already.